Knowing the weather is crucial information that helps you plan ahead. But finding an indoor outdoor thermometer that you can rely on is easier said than done since so many fail to live up to expectations. Or worse yet, they break easily or have problems giving accurate readings. To help you find the perfect device for your needs, we put together a review of the best indoor outdoor thermometers available in 2018, taking care to find the ideal balance between features, functions, and price. Our number one choice isn’t a typical indoor outdoor thermometer, but rather a complete home weather station. It has fully customizable features and an extensive list of functions that impress even the biggest weather enthusiasts. The top choice does much more than just measure high and low temperatures and humidity. Once you see what a top-quality weather station can do, you’ll never go back to an old-fashioned temperature gauge again! Before we go any further though, let’s take a closer look at why you should consider a home weather station over a basic indoor outdoor thermometer. Although many people use these terms interchangeably, there is a world of difference between an indoor outdoor thermometer and a complete home weather station. So there’s no confusion, we’re going to go over the differences with you. An indoor outdoor thermometer, as its name suggests, is a thermometer that can measure temperature and humidity inside and outside while also providing the date and time on a convenient display console. Although higher-end models may also measure barometric pressure and provide a weather forecast, these are the limits of their functionality. Taking things several steps further, a home weather station offers a more comprehensive report of your local conditions. These more advanced devices also show you wind speed & direction, rainfall, UV, solar radiation, dew point, heat index and wind chill. Even more exciting is the internet connectivity and smart home integration. Our recommended weather station has WiFi connectivity with remote reporting so you can view historical and real-time conditions on your phone, computer or tablet at any time anywhere. It also pairs with Google Assistant and Amazon Alexa, which means you can ask a compatible device (e.g., Amazon Echo or Google Home) for the current indoor or outdoor conditions and you'll receive your very own local weather report. Plus, there is IFTTT compatibility to control other smart devices throughout your home with automatic triggers. As you can imagine, the extra functionality means that home weather stations are more expensive than basic indoor outdoor thermometers. But if knowing local weather conditions is important to you, a home weather station is a must. We believe that a system which can provide wind readings and rainfall measurements on top of temperature and humidity is the best solution for a complete and accurate view of your local weather. Right now, there’s one home weather station that we recommend above any indoor outdoor thermometer. Our top recommendation is the Ambient Weather WS-2902A Osprey WiFi 10-in-1. It's a high-quality device, packed full of features, all at an affordable price point. Click here to check the price of the WS-2902A on Amazon. To help you compare the WS-2902A with the best indoor outdoor thermometers on the market, use our comparison chart and in-depth reviews below. Based on extensive research, testing and a close look at customer opinions, the Ambient Weather WS-2902A is our top recommendation. This home weather station represents value for money, but if you have a lower budget or don’t need this level of functionality, we also have plenty of worthy indoor outdoor thermometers to fit your needs. Take a look at our reviews of the best rated wireless indoor outdoor thermometers here. The Ambient Weather WS-2902A is our top recommendation, and it’s not hard to see why when you review the capabilities of this weather station. The outdoor sensor operates wirelessly and is powered by a solar panel with batteries used as a backup to ensure that it’s delivering you accurate measurements 24/7. All the information from the outdoor sensor is sent to your indoor display every 16 seconds from as far away as 330ft line of sight or 100ft under most conditions. The LCD indoor color display receives power via a wall adapter with batteries used as a backup, so you never miss a reading. You can see from this list of functions that the WS-2902A provides a full home weather station experience. Due to this high level of functionality, it’s more expensive than a standard indoor outdoor thermometer, but for its price point, it represents excellent value for money, which is why we recommend this as our top pick. To help you better understand what you can expect from the Ambient Weather WS-2902A, let’s take a closer look at some of the more interesting features of this device. Ambient Weather is not a new player in the weather instrument game. They're well known for the accuracy of their home weather systems and based on our experiences and the reviews of other owners of the WS-2902A, this latest model lives up to those same standards. These precise measurements mean you will always have an accurate report at your fingertips. The station updates on the indoor console every 16 seconds and sends updates to the internet every 60 seconds. A key contributor to the accuracy of the WS-2902A is the radiation shielding, which comes as a standard feature on this model. Radiation shielding minimizes the impact of direct sunlight exposure and encourages natural airflow around the temperature and humidity sensor, ultimately enhancing the accuracy of readings taken during daylight hours. The most exciting feature of the WS-2902A is its integration with smart home software like Google Assistant or Amazon Alexa. 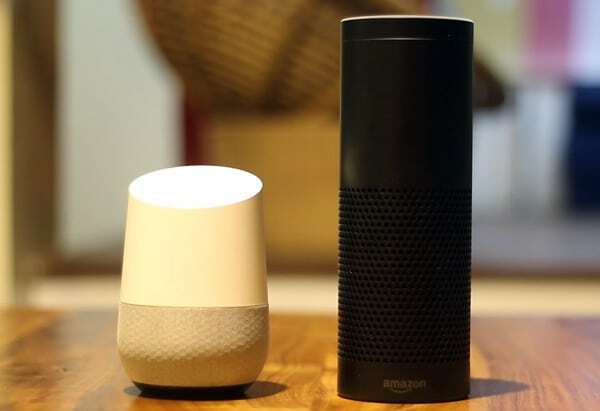 Once connected to your smart home system, you can ask your Amazon Echo or Google Home device for an up-to-date report on the indoor or outdoor conditions at your house. It gets even better though. The WS-2902A also has IFTTT compatibility. This means you can set up automatic triggers for other devices in your home based on the weather. Control external devices such as sprinklers, blinds, lights, and switches. Another great feature of the WS-2902A is the ability to connect the device to Weather Underground and the Ambient Weather Network thanks to the built-in WiFi connection. Weather Underground uses data from personal weather station owners across the world to provide a full picture of real-time conditions, forecasts and historical averages. The Ambient Weather Network is the proprietary, user-friendly cloud platform from Ambient Weather—it’s designed for your personal use to create alerts and view your station’s historical and real-time data on any device. Accessing data from these services remotely is priceless. It gives you an unprecedented level of weather information right on your phone, tablet or PC. If you want an affordable and user-friendly home weather station that offers many more functions than a regular indoor outdoor thermometer, buy the ﻿﻿﻿Ambient Weather WS-2902A no﻿﻿w from Amazon﻿﻿﻿! The AcuRite 02027A1 is a good option if you want a reliable indoor outdoor thermometer but don’t need all the bells and whistles of our top recommendation. 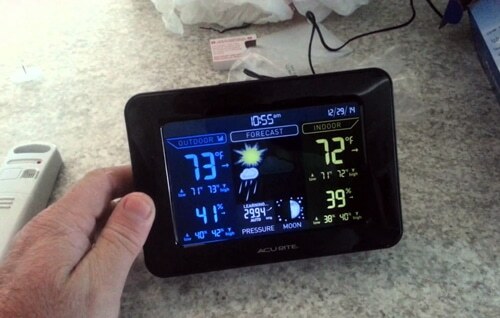 It has quite an attractive design and a bright color display that shows weather information very clearly. Most users like this unit’s easy set-up although you may find that it needs some calibration to get accurate results. One big downside of this device is that the outdoor sensor only runs on batteries. This means that even if you use rechargeable batteries, you will need to change them at regular intervals. It’s all too easy to forget to do this and then your readings will be interrupted. The AcuRite 02027A1 provides indoor and outdoor temperature and humidity, forecast, moon phase and barometric pressure. The display console also shows you the date and time, daily high and low readings and all-time high and low readings. But what’s not provided is the ability to set alerts, internet connectivity and rainfall and wind measurements. As you can see, this unit has some great features, which makes it an excellent budget choice if you cannot justify the price of the WS-2902A. The affordable price tag of the AcuRite 02027A1 also makes it an ideal gift for a weather enthusiast. However, only go for this model if you don’t want a full range of sensors or internet connectivity. If you want an affordable indoor outdoor thermometer for your home get the AcuRite 02027A1 here on Amazon. For measuring the temperature and humidity in multiple locations, the best indoor outdoor thermometer you can find is the Ambient Weather WS-10-X4 Wireless Thermo-Hygrometer. It supports up to eight sensors, including a pool sensor, which makes it perfect for larger homes or situations where you want to monitor multiple areas. The WS-10-X4 includes four remote sensors, and five additional sensors can be added. Plus, there is an integrated sensor inside the display console. Unlike the more premium WS-2902A, the base unit and sensors all run on batteries. Although there are reports of the batteries lasting for months at a time, replacing the batteries in up to eight sensors distributed around your home can be a tiresome chore. The console allows you to set alerts when temperature and humidity readings reach certain thresholds—these alerts display both visually and audibly through the unit. The console also displays maximum and minimum readings for each connected sensor. If you choose the Ambient Weather WS-10-X4 for monitoring weather in and around your home, you will not be getting a full range of readings—just temperature and humidity. While these two readouts are important for average users, they do not give enough information for forecasts. This unit is without a doubt great value considering the number of sensors it supports, but you miss out on the full range of readings from higher-end models. Purchase the Ambient Weather WS-10-X4 on Amazon. The La Crosse Technology C85845 weather forecast station is a decent choice if you want an accurate reading of temperature and humidity at home. While it does provide forecasts as well, the barometric pressure is not displayed on the console. When looking at the base unit, you can see that it is stylish with an attractive design and the information is clearly displayed on the color screen. The customizable alarms based on the weather readings will mean that you never leave home in cold weather without your jacket ever again. If you want a stylish and straightforward unit for the home, then you can do a lot worse than the La Crosse Technology C85845. 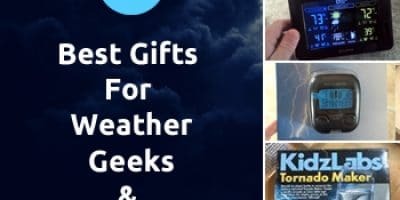 However, if you want more detailed weather reports and internet connectivity we recommend a complete home weather station. Another offering from La Crosse is the V10-Wth-Int indoor outdoor thermometer. Although it is a budget offering that has limited functionality compared to our top recommendation, it is still a very worthy choice. The thermometer performs admirably for a device at this price point. The V10-Wth-Int doesn’t take enough readings to create a local forecast, but it can access online forecasts from the National Weather Service (NWS) via its WiFi connection. The standout feature of the V10-Wth-Int is its remote reporting with the La Crosse View app. Through the app, you can view and track weather conditions and set alerts and receive push notifications all from the convenience of your smartphone. If you want a simple and affordable indoor outdoor temperature gauge, then this is an excellent choice. You may not get the broadest range of readings or highest accuracy, but it is perfect for checking the weather conditions before you step out each day. Of all the digital indoor outdoor thermometers reviewed here, the AcuRite 02081M is one of the most visually appealing. Both the monochrome and color displays look great, and the unit fits nicely on a tabletop or mounted on a wall. Unfortunately, the low price point means that you don’t get a whole lot of features. The indoor unit displays temperature, time, date, and a forecast. Even though the unit claims to measure barometric pressure, which is the most important metric for forecasting, the information is not displayed on the screen, so the forecast accuracy is questionable. Be aware that there are also no humidity readings here. At this price point, there are a lot more options on the market that provide additional functionality. If all you need is a good temperature reading and a nice looking clock and calendar for your home, then the AcuRite 02081M is a suitable choice. If you want more advanced readings, you’ll need to go for the more feature-rich Ambient Weather WS-2902A. If you are not a weather enthusiast, then it can be hard to understand what makes a good wireless indoor outdoor thermometer. There is a whole range of readings and features that you need to decide between and the choice can seem overwhelming. To help make your decision easier, let’s take a closer look at each of the factors to consider when buying a digital indoor outdoor thermometer. Be aware that you will only find these features in a complete home weather station. After testing many models, the best weather station we have reviewed is the Ambient Weather WS-2902A. Barometric pressure is the measurement of the pressure that air is exerting on the surface of the earth. More advanced indoor outdoor thermometers measure barometric pressure. High air pressure is an indication that air temperatures are lower and can bring blue skies. Low air pressure tends to occur as warmer air rises in the atmosphere. This can cause stronger winds and promote the formation of clouds. Monitoring air pressure in predominantly sunny locations may show only rare changes, and it can become a bit boring. If you live somewhere with drastic seasonal changes though, you will quickly begin to see the link between changes in weather and air pressure. Accuracy is without a doubt the most important aspect to consider when buying a wireless indoor outdoor thermometer. You are likely interested in a weather station at home so you can get accurate information, which is limited by the unit you choose. These accuracy ranges listed above for the WS-2902A are within acceptable limits, and you should not purchase a device with an accuracy range too much outside of this. Pick a location that is approximately 5-6 feet off the ground where natural air can circulate freely around the sensor. If you are not getting accurate readings, try moving your sensor to an open location with constant shade. A useful feature of the AcuRite sensors is the ability to hang them. Many people place them under the eaves of their house, or even in a tree. If you are finding it hard to locate the perfect shaded spot for your sensor, then consider using a radiation shield. Radiation shields help provide protection and shade for the sensor while still promoting natural airflow around it. Using a radiation shield increases your options for placement. Even if you think you have the perfect spot for your sensor, we still recommend purchasing a radiation shield for the most accurate readings. The WS-2902A comes packaged with a radiation shield which allows it to be installed in direct sunlight without impacting on accuracy. 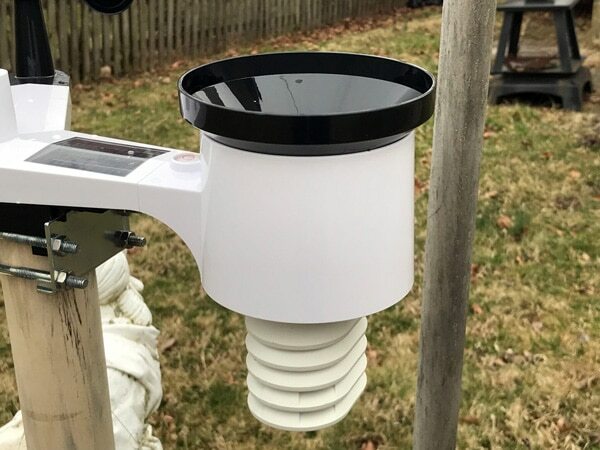 The radiation shield on the Ambient Weather WS-2902A (pictured at the bottom underneath the rain gauge) protects the outdoor temperature and humidity sensor. If you choose to buy our number one recommendation, the WS-2902A, there is a little bit more to think about when siting the station. You will need to consider the positioning of the station to maximize the accuracy of the rain gauge and anemometer (which measures wind speed and direction). The official standards for weather station installations require rain gauges and temperature sensors to be at eye level, approximately 5-6 feet from the ground, while anemometers should be 33 feet high. We have written a complete guide on weather station siting with mounting ideas here which will help you understand the requirements better. Typically, very few home users will be able to get their anemometer as high as 33 feet so you should aim to position the all-in-one sensor somewhere in the middle. 10 feet should be sufficient for all the sensors. The most important thing is to make sure the station is clear of any major obstructions like large trees and tall buildings that can affect the wind and rain measurements. You will also require a sturdy mount to install your weather station. We recommend the EZ-30-12 stable mounting kit from Ambient Weather. It’s affordable, and it makes the installation a breeze in comparison to creating your own with supplies from the local hardware store. Click here to get the EZ-30-12 stable mounting kit. If you have other smart devices already, then adding a weather station is the logical next step. Adding weather sensors to your automated home is a great way to increase the functionality of your setup by controlling your smart devices with any changes in the weather. If this is your goal, then the WS-2902A is the only device we reviewed that can fulfill this function. Ask Amazon Alexa or Google Assistant for a local weather report supplied by the data from your very own weather station. With smart home integration, the WS-2902A is compatible with Google Assistant or Amazon Alexa to deliver you a customized weather report from any compatible device, anytime you want. IFTTT takes customizability to another level, where you can have other systems at home triggered by alerts from your weather station. Trigger sprinklers at specific temperatures or when there has been minimal rainfall, turn on lights automatically when it gets dark, or maintain a steady home temperature with automated heating and cooling—the opportunities are endless. 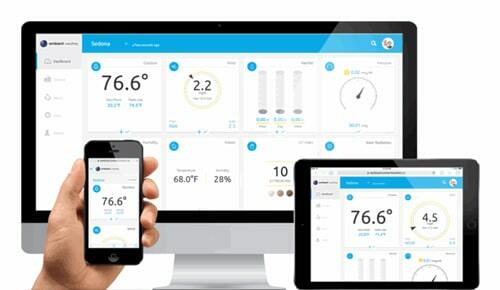 Monitor your weather station's data from any device with the Ambient Weather Network cloud platform. The setup for connecting to the Internet using your smartphone or tablet with the WS-2902A is very straightforward and one of the reasons it was our number one pick. Both Weather Underground and the Ambient Weather Network are great ways for you to share your collected data and view it remotely. Connect with Weather Underground where you can share your personal weather station’s data alongside more than 250,000 other stations around the world and contribute to the network that creates more accurate hyperlocal forecasting. There’s also the option to connect with the Ambient Weather Network, which is designed for your personal use to monitor your local conditions in real-time, view historical data and set customizable alerts from any platform. The Ambient Weather WS-2902A has a large, easy-to-read color-coordinated display console. The display is your primary interface with your digital indoor outdoor thermometer. You need to make sure you choose a device with a high-quality screen to avoid frustration. Here are a few things you should consider. Generally, with screens, larger is better. Bigger screens can display information far more clearly than smaller units, which can sometimes feel cramped. Brightness and viewing angles are also very important, especially for units that are mounted near windows where they’re exposed to sunlight. For the most seamless user experience, choose a model where a wall outlet powers the display. Although many devices say that batteries can be used, these should only be considered as a backup if the power fails. The large screens on the indoor units consume a lot of power, and the batteries will lose charge quickly if you just rely only on them! For most devices, when being powered from just the batteries the display consoles brightness will be dimmed right down to preserve power. So it’s best to keep it plugged in for better readability during the day. You need to give as much consideration to mounting the indoor display console as the outdoor sensors. Don't forget it has its own built-in sensors too! The display units often have options to free-stand on a tabletop or desk, or you can mount it on the wall. This gives you a lot of choice about where to put the display, so it has access to a power socket. Just be careful that it is not near any appliances that radiate heat which can affect your indoor temperature readings. Some people need a device that can cope with many sensors, and for this, we recommend the Ambient Weather WS-10-X4. With four sensors included and support for up to eight sensors in total, you can get multiple feeds of information seamlessly delivered to your display console. The old saying that ‘you get what you pay for’ has never been more accurate here. You can get a cheap indoor outdoor thermometer that will do a serviceable job, but it will not be reliable in the long term or offer you comprehensive insights into the weather. If you want the full home weather station experience from a device like the WS-2902A, it will cost more, but the value it provides is unmatched. The WS-2902A is durable and sturdy (it's built to withstand harsh weather conditions), it offers comprehensive weather insights and user-friendly internet connectivity for remote monitoring from any device. 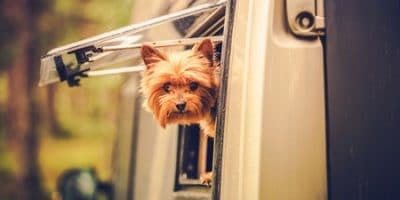 These key features make the initial investment more than worth it. With a top quality indoor outdoor thermometer, you can quickly and easily get accurate and localized weather information delivered straight to your living room or portable device. Although it is great to be informed, the benefits don't stop there. 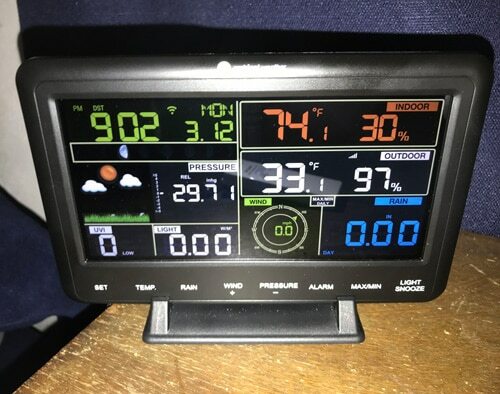 Using a weather station that connects to the Internet allows you to get alerts about changes in the conditions even when you are away from your home. In some of the more advanced models, you can also link your weather readings to other smart home appliances, automatically controlling them based on movements in the weather. We know that choosing the best indoor outdoor thermometer can be confusing, which is why we did all the legwork and testing for you. Our number one recommendation, the WS-2902A is not the cheapest model, but it is feature-packed and provides massive value to home users and weather enthusiasts. If you want the best rated indoor outdoor thermometer on the market click here to get the Ambient Weather WS-2902A Osprey WiFi 10-in-1 for your home! After reviewing the best wireless indoor outdoor thermometers on the market, we found that there was more value to be had from a complete home weather station. In particular, we recommend the WS-2902 station over any standard indoor outdoor thermometer due to its high degree of accuracy, user-friendly internet connectivity and the long list of weather measurements.